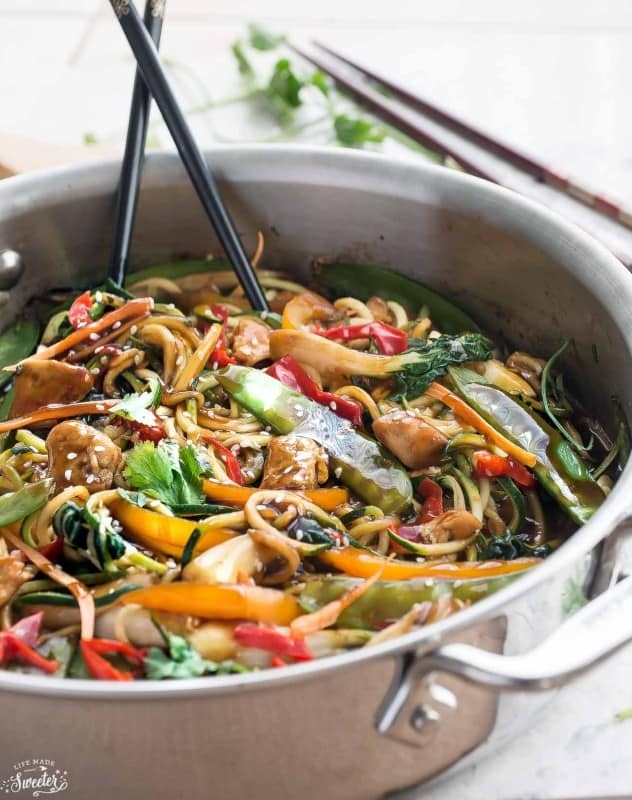 Chicken Chow Mein Zoodles – the perfect easy and healthy 30 minute weeknight stir-fry meal made in just one pan. 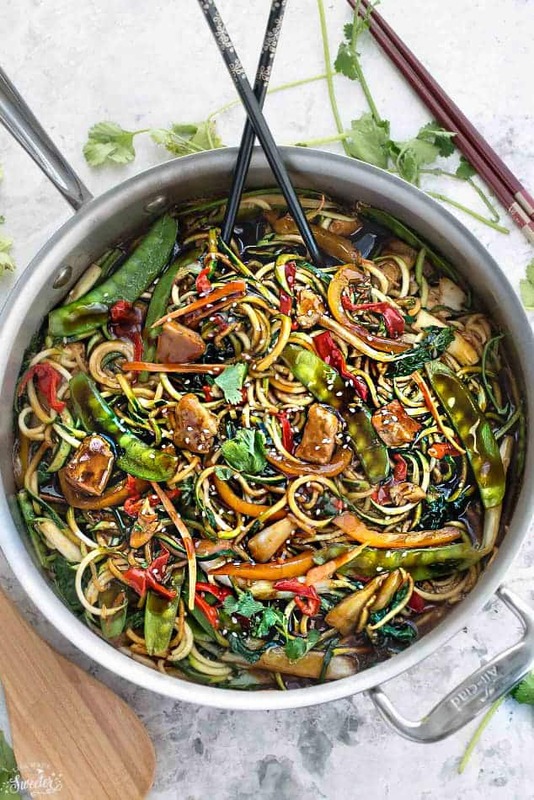 Best of all, it’s packed with fresh vegetables, zucchini lo mein style noodles and a flavorful authentic sauce SO much better than takeout! We’ve been on a big noodle kick lately. 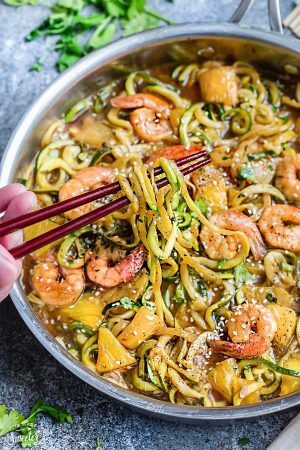 Noodles are our favorite — rainbow, lo mein, pasta — oodles of zoodles – my family loves them slurping them all up! 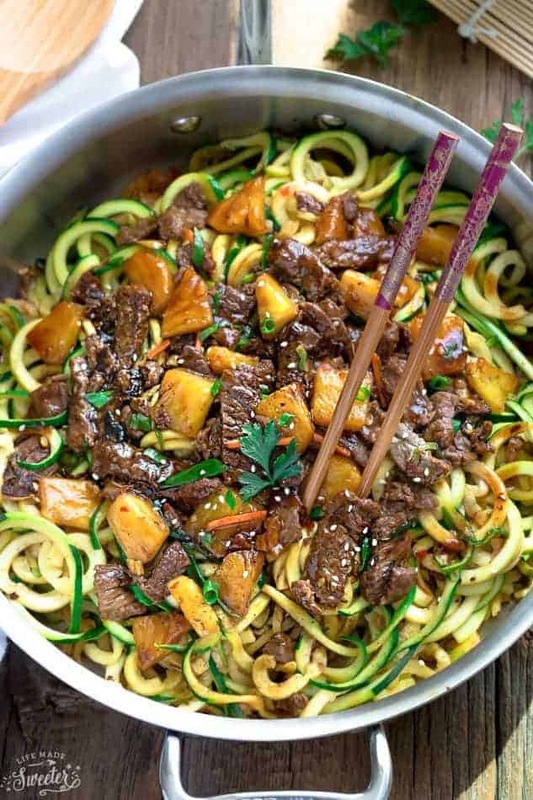 Since I am always trying to lighten up our meals, swapping out the noodles for spiralized veggies makes them lower carb (Teriyaki Chicken Zoodles, Mongolian Beef Zoodles, Kung Pao Chicken Zoodles)…plus you get an extra serving of veggies. Zucchini is our favorite but there are so many other possibilities like sweet potatoes, daikon, cucumbers and so many more! 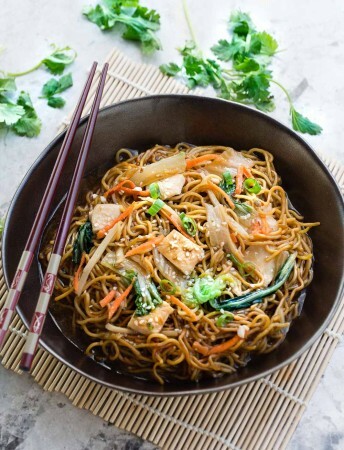 This Chow Mein shows up regularly around here but you can easily make this healthier by leaving out the egg noodles for zucchini noodles instead. So our new current favorite? 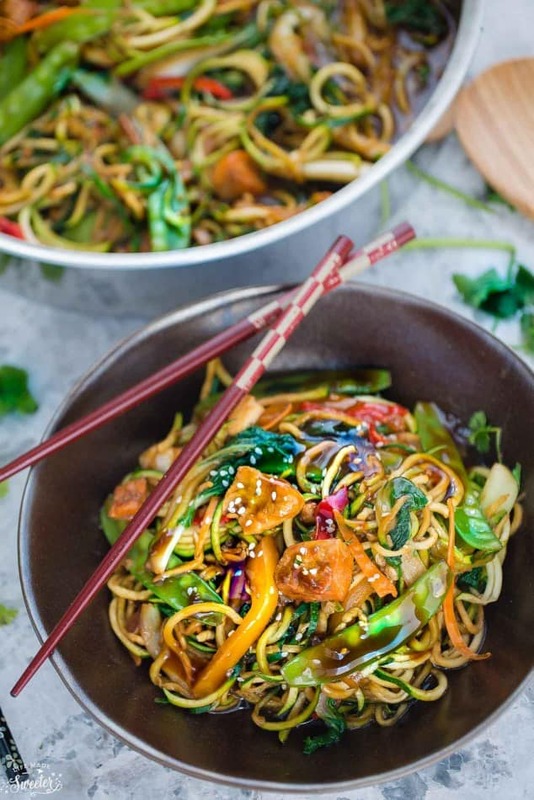 These Healthy Chicken Chow Mein Zoodles! 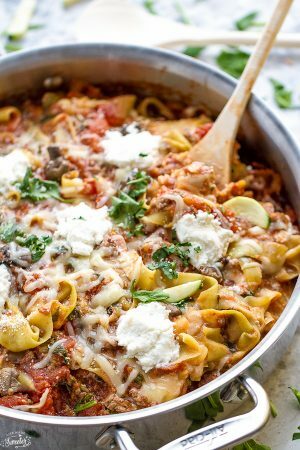 It’s super easy to whip up and comes together in just one pan or pot. 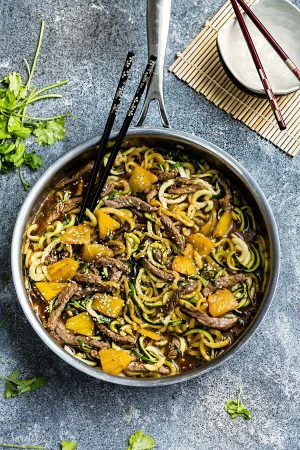 Coated in the same flavorful savory sauce just like the one you love at your local Chinese takeout restaurant but it’s so much better for you at only 200 Calories per serving with zucchini noodles. It’s easy to customize so you can totally use whatever you have in your fridge. Not a fan of chicken? Just use your favorite protein or make it meatless with tofu or tempeh. 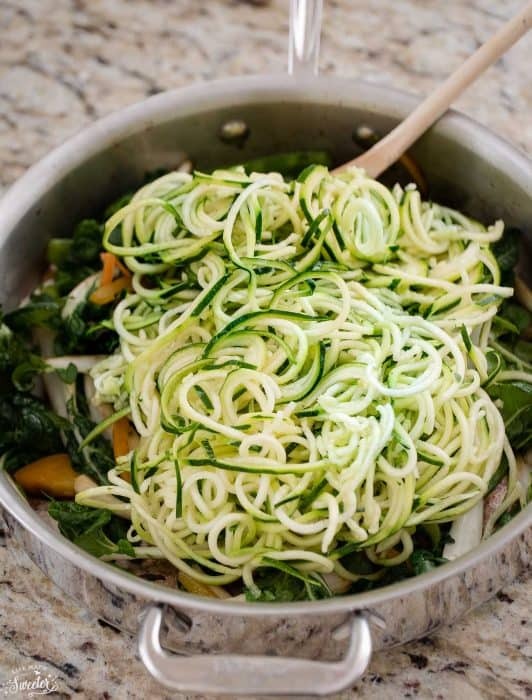 This zoodle dish comes together in less than 30 minutes so it’s perfect for those busy weeknights. 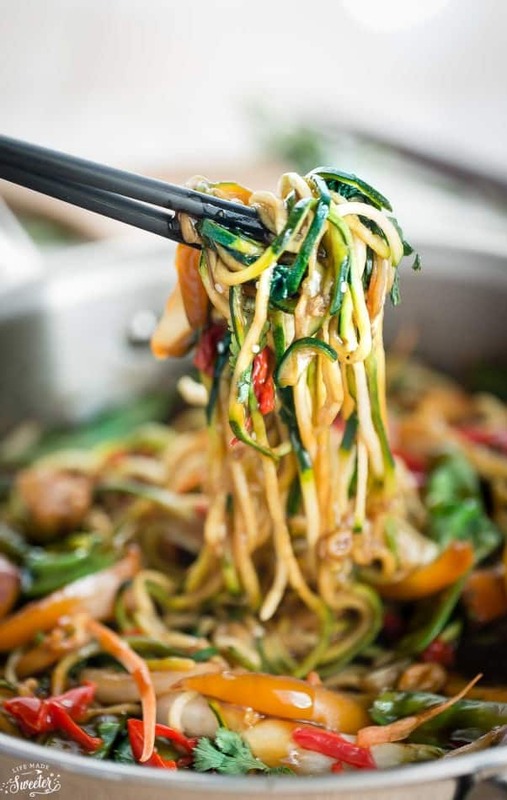 Just grab a fork or a pair of chopsticks and slurp up those oodles of zoodles. 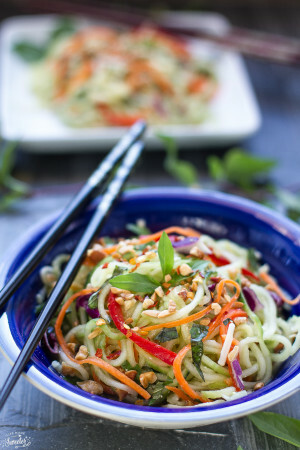 Packed with fresh vegetables, zucchini noodles and a flavor-packed sauce, it makes the perfect easy weeknight meal and so much better than takeout! In a medium bowl, whisk together all the ingredients for the sauce, until combined. Season chicken with salt and pepper and drizzle with 1/2 tablespoon of sauce. 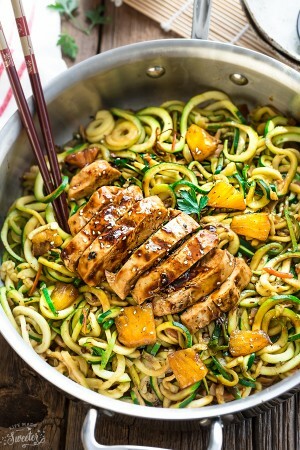 Allow to marinate while preparing the zucchini noodles. 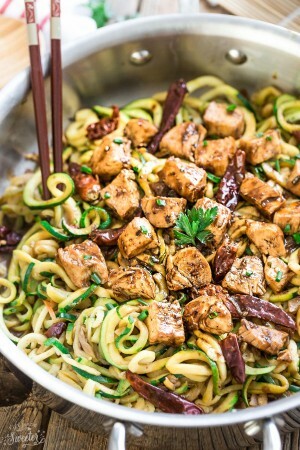 Cut zucchini into noodles with spiralizer or vegetable peeler. Pat dry with paper towels. Heat oil in a large wok or skillet on medium high heat. Add chicken and cook until brown on both sides, about 3-4 minutes. Transfer from pan onto a plate. Set aside. Add remaining olive oil to the same skillet. 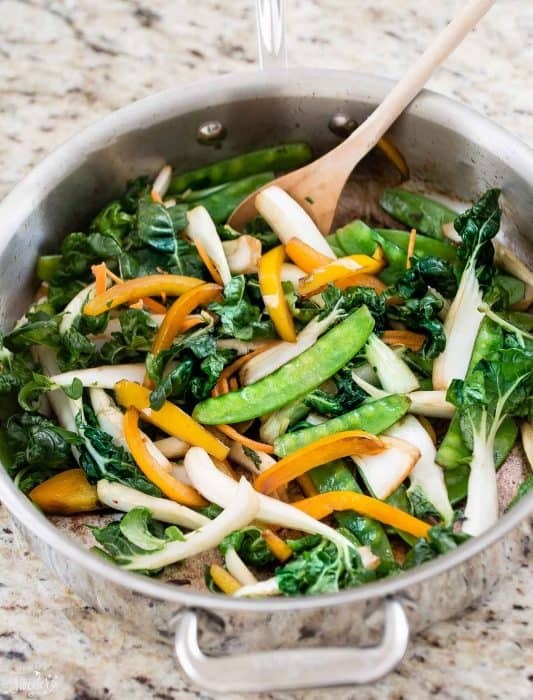 Add the peppers, snow peas and bok choy and cook for about 2 minutes until soft and tender. Add chicken back to the pan and stir in the sauce. Turn heat to high and allow the sauce to thicken and bubble. Adjust seasonings as needed. Add the zucchini noodles and gently toss to coat using tongs. 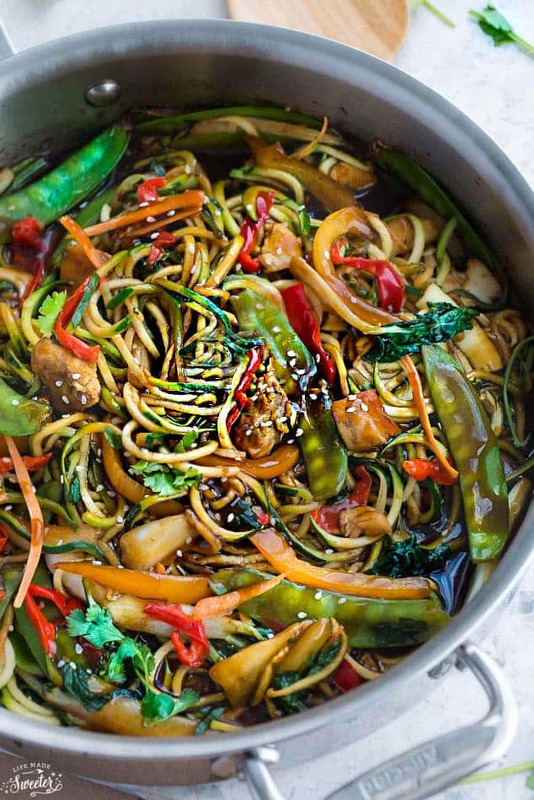 Cook until zucchini noodles are just tender (about 1-2 minutes - do NOT overcook), and remove from stove. Serve immediately and garnish with sesame seeds if desired. ** do not overcook for longer than 2 minutes or else noodles will get too soft and mushy.